I would like some thoughts around the issue of home"work". A few weeks ago, at meet the teacher night, a few of us spoke about homework and what that will look like this year. I was open and honest with you in that I have read a lot of articles over the summer, and more and more research has supported that 'traditional homework' has done nothing to improve students' academic performance or their ability to think and learn. 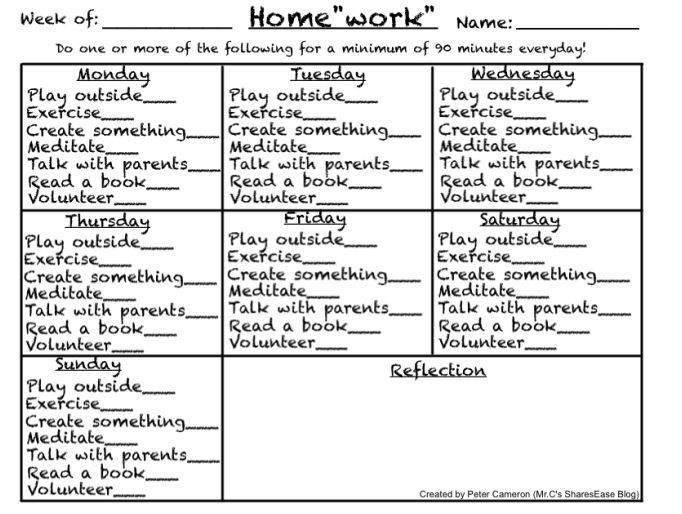 What if homework looked different? "My views on homework have changed and evolved over my 20+ years of teaching. I’ve arrived at the conclusion that traditional homework has done nothing to improve my students’ academic performance or their ability to think and learn. In fact, I believe it’s had somewhat of the opposite effect. When homework piled up, stress increased and students came back to school tired, overwhelmed and burnt out. I also found that students who had little support from parents or guardians with their homework (whether it be assisting them or encouraging them to get it done) tended to come back with it incomplete. This created a large gap in learning for my students who weren’t able to complete their homework. Today, homework has evolved to home ‘share’. My students are now tasked a couple times a week to share a piece of writing with a parent, solve or explain their solution to a single “real math” problem or create one of their own. Parents are encouraged to write comments on their child’s work and initial it after their child has shared it with them. The result? Home ‘work’ is getting done much more consistently by all students within my classroom. Parents say they feel more involved in their child’s learning and the stress level within households has diminished. " What if homework looked something like this? I am very interested in parent feedback. I will introduce this homework over the course of the next two weeks. 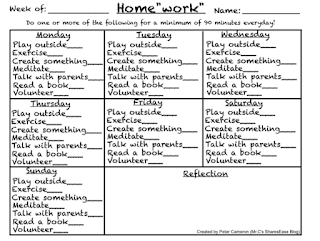 After two weeks, I will send out a survey to see thoughts on this approach to homework. A thank you to Peter Cameron for sharing his work and thoughts around this subject.